In spinning news, things just get better and better all the time. 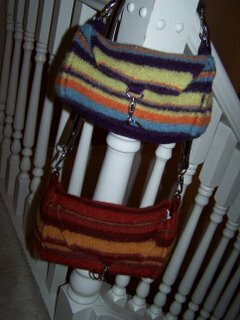 Here are some mitts I knit with some of my earliest handspun. I dyed up roving in Blue Agate Beauty and spun it thick 'n thin into chunky. The mitts are soooo soft. I bought a roving from a wonderful seller on etsy called Pigeonroofstudios. But don't shop there, 'cuz her rovings are so popular that they sell out in minutes, and I don't need any more competition. Hers is the one on the right. She called it Tree Scum. Mine is the one on the left. I called it Little Green Apples. After I spun them both as singles, I plied them together into what I'm calling Apple Core. 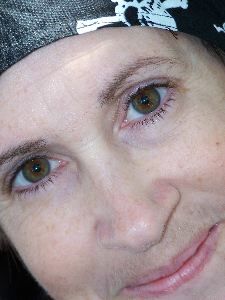 I love it and kept a skein for myself. I listed the other skein at etsy. This is another of my recent spun yarns. I haven't listed it yet, and not sure if I will or not yet. I will likely call it Embers since I dye that colorway on other yarn. I plied it with two different rovings that I spun into singles. This one never got named. I took it to an appointment to show off to a knitter-woman I know. She couldn't stop cuddling with it and finally asked (sort of begged) if I would sell it to her. It's a single of 100% Blue Face Leicester that I spun by stripping off roving that I dyed and reversing two strands so that they spun as they mixed colours from each other. And finally, a couple of delectable rovings I dyed last week. The first one is BFL; the second one is merino. Wheeeee, I love to spin yarn! I had no idea that spinning was so much fun. In my last post, I showed off Little Red Schoolhouse, and then the next day it sold. I was so proud of the little yarn that could. I've been selling yarn for quite a while now, so it's not that big a deal anymore, just a really fun job. But I felt so pleased to list and sell one of my own handspun yarns. I've been learning very quickly, and enjoying every bit of it. This one is called Marge. I spun some pretty corriedale roving into a thicker strand and some soft merino I dyed orange into a thinner strand and then plied them together. My kids and The Man loved it and said it looked like Marge Simpson. Marge is listed in my shop to rave reviews. Oh Homey. This one doesn't have a name, but I'm keeping it for now. One strand of merino in Blue Agate, and one strand of merino in a green and purple colorway (remember the roving drying on the rack?). Verrrry soft. I think I'll make a second one, and then we're talking yardage. This one is MINE, so don't even ask. It took me HOURS to spin. I was testing out a Fishy Wishy theory, and it worked out exactly as I hoped, so I'm thinking socks. I'll have to make a second batch, but I have the roving ready to go. And speaking of handspun, these are some socks I started on Christmas Day with some lovely bulky handspun from Shunklies.etsy.com. 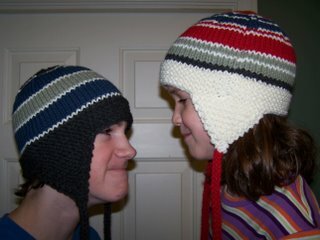 Beautiful, soft and so fun to knit. 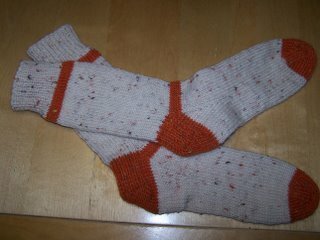 I got one super quick sock done on The Day, and hoped to finish the second one on Boxing Day. Don't know what happened. Maybe tomorrow. It was while knitting these that I knew I had to get a wheel as soon as possible. I can't tell you how much I love to have my very own yarn room. I have installed all my yarn to dye, my personal stash, my bins of finished yarn, and a beautiful collection of art/hand spun yarns. Shelves are stacked floor to ceiling with yarn for dyeing. My own stash and mailing supplies all fit in the closet. Even my beads and stitch marker supplies have a spot. The room had a clothesline running along one wall, where The Boy used to hang his artwork. Now I hang long skeins of handspun there. Skeins of handspun and yarn to dye fill little nooks and cubbies. I've decorated with my own paintings, and little goodies from friends and knitters warm up an already very inviting space. I have a comfy chair for sitting and knitting and a good light. And candles. The Man installed huge IKEA hooks along one wall for hanging skeins of yarn that are ready to dye. Finally, I put a bean bag chair in the room too, just in case I get a guest or two. Sometimes I hang out in there with the door closed, spinning and listening to my iPod. Sometimes I hang out in there with the door open, and one of my kids or The Man himself comes by to hang out and chat. I'm not in there all the time (why not?? ), but when I am, it seems to be the most popular room in the house. And many many times a day, I'm in and out of there, or I just stand in the doorway and look. And smile. Roving you say? Why is there dyed roving in my house? Yup, I'm doing the spinning thing now. I bought my wheel on Friday. It's a Lendrum Double Treadle, and I am having tons of fun plying, um, playing with it. Lendrum wheels are Canadian made (like me), and I found a distributor who lives about half an hour from where I live. She has just started up her home-based business, so if you're interested, send me an email, and I'll give you her number. You're also getting a few shots of my new yarn room here, but I'll talk about that in a later post. Look, up on the line. See the little white skein hanging proudly between that other more grown up looking spun yarn (not mine). The little white skein is my very very first ever bit of yarn spun by me on my new wheel. My second and third attempts have had lots of things done to them, so I'll post about those later. 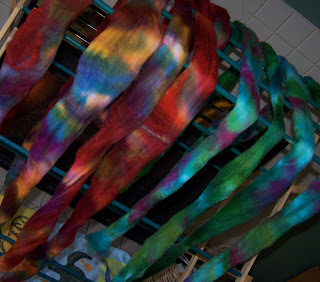 Then I dyed some roving in a version of my new colorway Blue Agate Beauty. Then I got really cheeky and tried spinning some fine yarn. See spool posing next to that gorgeous little sheep (thanks, T!). I plan to spin some more fine later on and then attempt to ply two strands together. I've done some more things with that Blue Agate roving. You'll just have to stay tuned on that. And if you look back at the photo of the wheel, you'll see Blue Agate chunky on the bobbin. 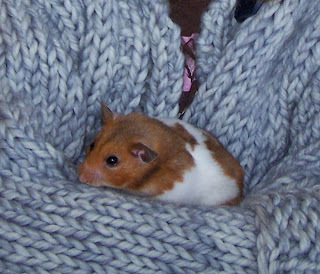 Benne likes my hams, so I told her I'd post a photo of Daisy enjoying H's cuddly new sweater. You've probably figured out that my shop is open again. Here is a new pair of mitts I just listed in some more luscious Hobbeldehoy yarn. This one is called HoneyCake.